As a K9 officer, Boone is trained to put his life on the line every day in the name of justice. But after he became the victim of a crime himself, and at the hands of his partner, no less, the system he defends seems lacking in teeth. On Tuesday, Deputy Brett Berry, from the Ramsey County Sheriff's Department, in Minnesota, pleaded guilty to charges of animal cruelty against Boone stemming from an incident that occurred last June. 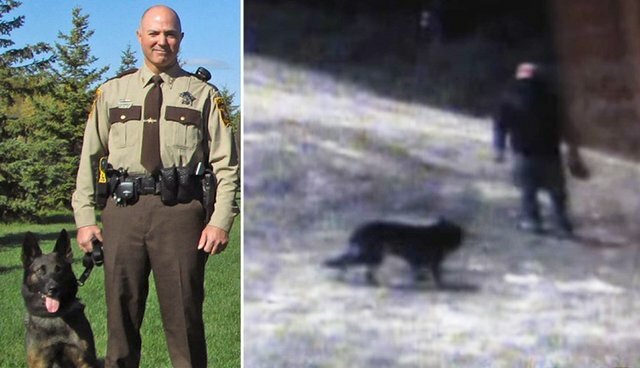 Surveillance footage taken at the scene, a casino parking lot where the officer was training Boone, shows Berry repeatedly striking the dog and throwing him against the ground, as KARE 11 news reports. Boone, who is trained to adhere to his partner's commands, appears confused by Berry's aggression and tries to find help at the casino's entrance, but the beating continues. Fortunately, Boone survived the ordeal without serious injury. Berry, who claims to have been "exceedingly drunk" when the beating occurred, was initially charged with two misdemeanors for animal cruelty and assaulting a public safety dog. As part of a plea deal the latter charge will be dropped. At a hearing next month, a judge will determine whether or not to accept the deal, which would result in Berry facing 90 days in jail and a up to a $3,000 fine. Perhaps most striking, however, Berry wasn't fired from the force. Although Boone was placed with a new handler, his admitted abuser will continue to work as a Ramsey County Sheriff's deputy in a new position. We are asking that he be fired, convicted of two misdemeanor counts and never be allowed to have or work with an animal again! The stakes are too high for the animals! This is simply unacceptable for an officer to conduct himself in this manner and he doesn't deserve to wear a badge! The Dodo confirmed with a spokesperson from the Ramsey County Sheriff's Office that Berry has been allowed to remain on the force. Following his guilty plea this week, the office has begun an internal investigation, but the spokesman declined to state if their findings could result in Berry losing his job. To learn more about what you can do to end police violence against animals, visit the Animal Legal Defense Fund here.